Place Royale and Lower Town (Basse-Ville) will appeal to history buffs. Let the collections at La Citadelle de Quebec and Musee de la civilisation capture your imagination. Go for a jaunt from Quebec City to Sainte Anne de Beaupre to see Sanctuaire Sainte-Anne-de-Beaupre about 30 minutes away. There's lots more to do: wander the streets of Terrasse Dufferin, contemplate the long history of Battlefields Park (Parc des Champs-de-Bataille), contemplate in the serene atmosphere at Basilique Cathedrale - Notre-Dame-de-Quebec, and admire the sheer force of Parc de la Chute-Montmorency. 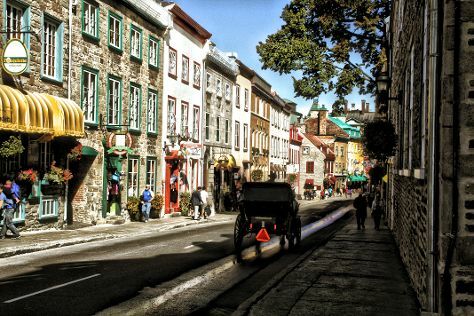 For more things to do, where to stay, maps, and other tourist information, read our Quebec City visit planner. If you are flying in from United States, the closest major airport is Quebec Jean Lesage International Airport. In September, daytime highs in Quebec City are 71°F, while nighttime lows are 52°F. Finish your sightseeing early on the 11th (Wed) so you can travel back home.